This fleet and the Army’s Ports of Embarkation operated throughout the war’s massive logistics in support of the worldwide operations. After the war the Army’s fleet began to resume its peacetime role and even regain the old colors of gray hulls, white deck houses and buff trimming, masts and booms with the red, white and blue stack rings. An example may be seen in the photos of the USAT Fred C. Ainsworth. Some confusion may exist in the precise definition of "Army ship" as many ships saw Army service during the Second World War that were never (a brief Army time or voyage charter) or only briefly part of the Army's fleet. Army owned vessels of the core fleet are quite clear, even though some of those switched between Army and Navy during the war. Close to those were the ships that were bareboat chartered by the Army, meaning that only the hull itself was chartered and Army was responsible for crewing and all other operational aspects. Others were long term allocations to Army by the War Shipping Administration so that they operated as Army transports and cargo vessels for much of the war. The more confusing ships are those that were short-term or time or voyage chartered ships. Philippine registered Dona Nati, part of "General MacArthur's fleet into 1942, "one of three ships to successfully run the Japanese blockade of the Philippines. After the war came the reorganization that led to the U.S. Department of Defense rather than a separate United States Department of War and Department of the Navy with the decision on maritime logistics going in favor of it being administered by the Navy. As a result Army lost almost all its big vessels. Many of the Army vessels were transferred to Navy with the transport types becoming components of the new Military Sea Transportation Service (MSTS now MSC) under Navy. Some of the Army’s specialized vessels became Navy commissioned ships (USS) or non-commissioned utility vessels. Digital photographs of a few of these vessels in Army service are provided at the Naval History and Heritage Command. Others were sold commercially or simply scrapped. The Army heritage of civilian crewed transports and cargo ships continued in the operating model for MSTS and its “in service” non-commissioned ships designated as U.S. Naval Ship (USNS). Some Army vessels, still crewed by Army civilians, just transferred were suddenly sailing before fully taking on the new service’s administrative functions and colors. The Army still operates 50 vessels of five types, excluding the United States Army Corps of Engineers ships. The US Army Corps of Engineers has a total of 11 Dredge Vessels, divided into hopper and non-hopper dredges. Six ships, allocated by the War Shipping Administration, were converted to repair and spare parts ships. Five, from 350 ft (110 m) to 390 ft (120 m) in length, were built on the Great Lakes from 1901 to 1913. The sixth, James B. Houston (1900) at 202 ft (62 m) was the Army owned Kvichak which had grounded off Canada, slipped into 80 ft (24 m) of water, then salvaged in 1941. All were U.S. Coast Guard crewed with Army in administrative and operational control as well as providing the repair detachments, the Army Marine Ship Repair Company (AMSR CO.). All served in the Southwest Pacific Area. Houston, which had first served in the Aleutians, was declared surplus while at Mariveles, Philippines and turned over to the Foreign Liquidation Commission in February 1946, reverted to U. S. Army Forces, Western Pacific (AFWESPAC) in April 1946, but was not used as a repair ship after being declared surplus. USARS J. E. Gorman (1909), 803d AMSR Co.
Koondooloo 524 grt, 191.7 feet (58.4 m) X 35.7 feet (10.9 m) X 14.8 feet (4.5 m): Acquired for Southwest Pacific Area permanent local fleet, Small Ship Section, a double ended vehicular ferry built in Scotland 1924 for Sydney Ferries Limited and converted 1937 into a show/excursion boat with dance floor and 1,700 passenger capacity. Converted by Army from coal to oil and fitted with a 30-ton boom Koondooloo (S-181) was used as a workboat in New Guinea servicing amphibious vehicles and vessels. Reconverted to a vehicular ferry 1951 and wrecked while under tow to Philippines in 1972. "Half Rufus" was the bow of the Liberty ship Rufus King which ran aground on Moreton Island, Queensland, Australia. The ship had broken in two with the bow salvaged by the Commonwealth Marine Salvage Board, taken over by the U.S. Army Small Ships Section and equipped with vertical boiler for power, a machine shop used for repairing vessels and bunkers for coal and fuel oil for refueling them. Given the number S-129 and dubbed "Half Rufus" the salvaged bow was towed to Milne Bay arriving 21 June 1944 and then Finschhafen where repair equipment was transferred to a barge in April 1945 and the bow section then used as a coal hulk. The 20 dry cargo barges originally intended for bauxite were taken by the Army and 17 were used in the southwest Pacific for storehouses. Of the 24 steam cargo concrete vessels, 17 were converted by the Army into floating storehouses, 5 were used by the Army as training ships and 2 found an honorable end when sunk to form part of the breakwater protecting the American landing in Normandy at Omaha beach. The Army had its own program for small boat construction and directly procured vessels and water craft that were under 200 feet or under 1,000 gross tons. Army F-ships (100-dwt) were little freighters built on the lines of a Dutch wooden shoe and had a capacity of about 100 tons with a maximum speed of 8 knots. During the war these little ships plied back and forth between Navy PT boat bases, Crash Rescue Boat bases, and Engineer Special Brigade bases in the pacific for the purpose of transporting personnel, hauling supplies and cargo, or occasionally for towing fuel barges and water craft, to bases along the coasts or to nearby islands. Three design number 225 vessels were built by Equitable Equipment Company in New Orleans, Louisiana in 1942, they most likely operated in Alaska or in Greenland waters. Eleven of these small ships were built for the U.S. Army Air Corps/Army Air Forces in late 1942 through mid 1943. The official designation was "Design No. 210, 150 Foot Steel Diesel Retrieving Vessel", sometimes termed "Aircraft Retrieving Vessel" in later references. Name format was "U.S. Army" over "H.A.# NAME" as indicated by a builder's model. Dimensions were 158' 3" LOA X 32' beam (moulded) at deck X 8' draft powered by two 300 hp diesels. and was equipped with a 30-ton jumbo lift boom along with regular cargo booms and had a cargo capacity of 500 measurement tons. These vessels were primarily used as supply ships, that could retrieve aircraft if needed. Army CS ships provided communications relays and acted as command posts (CP) for forward elements ashore. CSM (Maintenance) ships, in addition to acting as CS ships, were also equipped for radio repair operations to supply floating maintenance. CSQ (Quarters) ships acted as floating dormitories. CSN (News) ships were used by civilian reporters. The Army had a history of submarine cable work by the time of World War II operations dating back to the 1899-1900 period. Much of this work had been in relation to communications with far flung Army forces in the Philippines and Alaska. The Army Signal Corps used a number of cable ships for that work including Burnside, Romulus, Liscum, Dellwood and two vessels intimately associated with the Coast Artillery Corps controlled mine work at the coastal fortifications; Cyrus W. Field and Joseph Henry. That cable laying capability had been allowed to deteriorate to the point that the Army had to charter the C.S. Restorer in 1941. The Army entered the field of undersea cable work in connecting the military installations in the Philippine Islands. As with other cable work, some vessels were chartered. For example the vessel Orizaba (not the later Army owned vessel of the same name) was under Army charter from the Pacific Coast Steamship Company before being lost in 1900. The first ship supplied by the Quartermaster Corps to the Signal Corps for cable work was the U. S. Army Transport Burnside. That Spanish–American War prize was replaced by the larger Dellwood for work with Alaskan cables. There is some confusion on ship designators within even official records. The conventional commercial and nautical term for such ships was “C.S. (name)” for “Cable Ship.” The mix of U.S.A.T., C.S. and even the simple “Steam Ship” (S.S.) as seen in postwar construction of the SS William H. G. Bullard, later the USS/USNS Neptune can be somewhat confusing. All three terms are found in official usage. For example, Smithsonian Institution library records clearly show some of these Army ships as C.S. Dellwood, C.S. Silverado. Army’s ship management lay in the Quartermaster Corps and later the Transportation Corps. Technical management of the cable ships was under Signal Corps and the entire enterprise of undersea cable work was the very specialized realm of several large communications corporations which operated their own cable vessels and provided experts in handling cable equipment and cable. Each appears to have used familiar terms when noting the ships in records as seen in the Quartermaster reference and the records elsewhere. The nature of the work is such that specialized crews are required to operate the cable machinery and so the actual cable splicing and technical work. The ex-Coast Artillery ships involved in mine planting were military crewed. The C.S. Restorer was under charter and used civilians, many from its commercial crew, under Army contract. The remaining ships were probably mixed crews. Ten ships, nine being Maritime Commission type N3-M-A1 cargo vessel hulls being built at Penn Jersey Shipbuilding for the U.S. Navy or Lend Lease, were transferred to the Army for operation as Engineer Port Repair Ships. The other ship, first obtained for the purpose, was a commercial ship allocated by the War Shipping Administration. All the ships were managed and crewed by the Army Engineers organized into Engineer Port Repair Ship Crew units, named for Army Engineers killed in action during WW II and heavily modified from their original design. Some of these were substantial vessels, 300 feet long, with a 3,000-ton displacement and a crew complement of 60-plus men. They were seagoing diesel-electric hydraulic dredging vessels, normally functioning under the Corps of Engineers control and used for maintaining and improving the coastal and harbor channels around the U.S. coasts. During World War II, five seagoing hopper dredges already in civil service, were fitted with 3-inch deck guns and 20-millimeter antiaircraft guns. Four were sent to the ETO and one, the 'Hains', was sent to the PTO along with the cutter dredge 'Raymond', additionally four new Hains class armed dredges were constructed for use in the PTO. The U.S. Army Mine Planter Service (AMPS), under the Coast Artillery Corps, operated ships designated as U.S. Army Mine Planter (USAMP) to plant the controlled mines guarding approaches to coastal fortifications. Numerous smaller vessels not designated as USAMP worked with the planters in a mine flotilla. 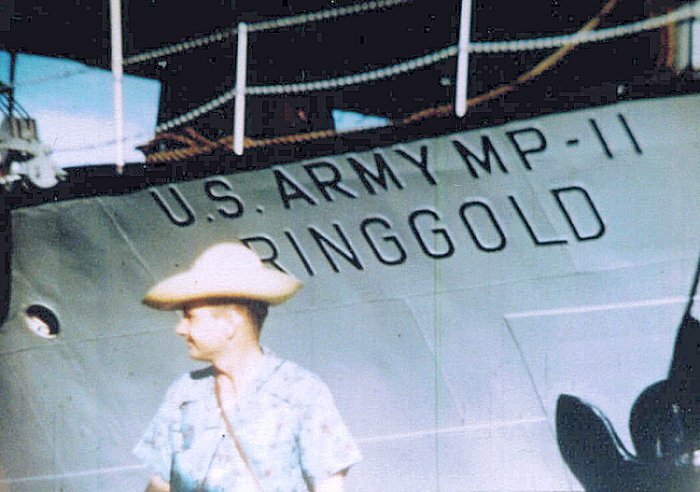 Maj. Samuel Ringgold (MP-11) (1942) NavSource photo showing USAMP name usage format. Note: Cyrus W. Field was a Signal Corps ship closely associated with mine cable work and sometimes listed with the planters. Joseph Henry was a cable ship transferred to the Coast Artillery Corps. Both were associated with the next generation of mine planter development that incorporated some cable capability into the 1917 and 1909 ships. Smaller vessels known as, "junior mine planters", or "pup planters", were occasionally employed as mine planters, but for the most part they served as freight and passenger boats for river and harbor duty. U.S. Army Cargo Vessel FP-343 ("FP" later changed to "FS"), a Design 381 (Vessel, Supply, Diesel, Steel, 177'), was later to become Navy's T-AKL-34. A class of small coastal and inter-island freighters were first designated "FP" for "freight and passenger" with early acquisitions being a variety of commercial hulls. Early in the war a number of designs were inaugurated. Some, such as Design 277 (Vessel, Passenger-Cargo, Diesel, Wood, 114') were wooden hull while the "classic" Design 381 (Vessel, Supply, Diesel, Steel, 177') was a miniature steel cargo vessel with two hatches and central booms. These, as all the smaller Army ships, were simply designated "U.S. Army (number/name) and were not designated U.S. Army Transport (U.S.A.T.). They were operated by Transportation Corps with a variety of crewing schemes. A few were all military, many were civilian crewed and a large number were U.S. Coast Guard crewed. The USCG crewed vessels have more history preserved than most of these little ships. U.S. Army Cargo Vessel FP-344 (redesignated FS-344). Transferred to the Navy in 1966, she became USS Pueblo (AGER-2). A number of vessels were operated by the Army as small coastal freighters and passenger vessels without being formally given FP/FS numbers. Ships known to fall in each of these categories appear in the list below. In general only ships owned, under long term bareboat charter or allocation to the Army, first through the Quartermaster Corps and later the Transportation Corps, were formally designated as a U.S. Army Transport (U.S.A.T.). Those under other arrangements continued operating as SS NAME. Essentially all maritime commercial cargo and passenger type vessels were under strict control of WSA under Executive Order No. 9054. Exempted from WSA control were combatants, vessels owned by Army or Navy and coastal and inland vessels. The FS numbered vessels and Army tugs do not normally have U.S.A.T. in their names. They and other smaller Army craft were simply designated as Army with "U.S. Army" over the number (photos). Army tugs were seen as far back as the American Civil War as with the 1862 screw tug Terror. World War II era tugs came in two general classifications, though those were not rigid and variances may particularly be seen in commercial vessels taken in early during the war. Seagoing tugs, 92'-100' or greater were designated Large Tug (LT). Harbor tugs were Small Tugs (ST). The Transportation Corps determined that at war's end it was operating 746 tugs of the LT/ST types. A large number of highly varied commercial tugs were taken into Army service above those constructed to Army designs and Army tugs of prewar design dating to the early 1900s. In addition to these there were a variety of small towing craft, numbering in thousands, termed motor towing launches (MTL), sometimes overlapping the STs in length, and marine tractors of 40'and less length, some with the colorful name of "Sea Mules" with dimensions of 40 x 13 x 8 and two Chrysler gasoline engines. All were simply U.S. Army (LT/ST #). Only the first eight WW II era LT numbered tugs built by Jakobson Shipyard, Oyster Bay New York, were given names during construction. The Army acquired commercial vessels or had in its inventory tugs early during WW II, before standardized design construction met requirements, that were LT in size which retained commercial names and did not have LT numbers. WW II LT construction did not use numbers greater than 935 with postwar LTs having four digit numbers until numbers starting with LT-801 were reused with 1993 construction. This page was last modified on 17 November 2015, at 00:56.